The Arabian Nights is your magic carpet ride to exotic lands full of wonders and marvels. First collected nearly a thousand years ago, these folktales are presented as stories that crafty Scheherazade tells her husband, King Shahryar, over a thousand-and-one consecutive nights, to pique his interest for the next evening's entertainment and thereby save her life. Among them are some of the best-known legends of eastern storytelling, including the "Sinbad the Sailor," "Aladdin and His Magic Lamp," and "Ali Baba and the Forty Thieves." This collection features more than twenty stories, in the classic translation of Sir Richard Burton, published between 1884 and 1886, and full-colour illustrations by Renata Fucikova and Jindra Capek. 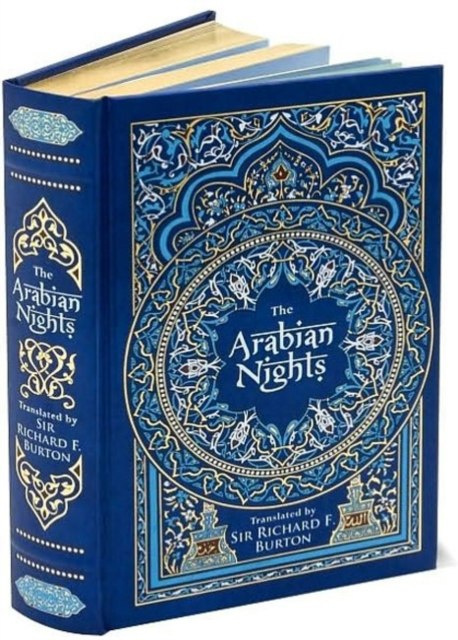 The Arabian Nights is one of Barnes & Noble's Leatherbound classics. Each volume features authoritative texts by the world's greatest authors in an exquisitely designed bonded-leather binding, with distinctive gilt edging and a silk-ribbon bookmark. Decorative, durable, and collectible, these books offer hours of pleasure to readers young and old and are an indispensable cornerstone for every home library.